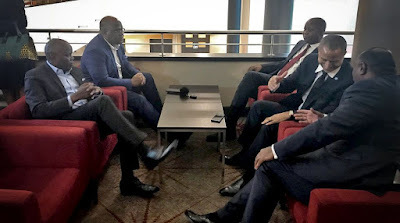 Opposition leaders from the Democratic Republic of Congo have gathered in Belgium's capital, Brussels, to decide on a joint candidate for long-delayed elections now scheduled for December. Journalists have tweeted photos of the gathering, showing Jean-Pierre Bemba, Moise Katumbi, Felix Tshisekedi and Vital Kamerhe among those preparing to make an expected announcement. Of those pictured, only Mr Tshisekedi and Mr Kamerhe are on the list of official presidential candidates. Last week, DR Congo's highest court ruled that Mr Bemba was ineligible because of a conviction for witness tampering by the International Criminal Court. While Mr Katumbihe remains in exile after the authorities refused him entry to the country last month ahead of a deadline to register as a candidate. A wealthy businessman and former governor, Mr Katumbi left DR Congo in 2016 and was as later sentenced in absentia to 36 months in prison on charges he says are politically motivated.